What Is a La Parrilla? A La Parrilla is barbecued or charcoal-grilled meat. It is also known as a la brasa. In Spanish, la parrilla refers to a BBQ grate, and la brasa means a live or hot coal. Most people make pollo a la rasa, which uses chicken. Pollo a la Brasa is also known as Peruvian chicken in the United States. 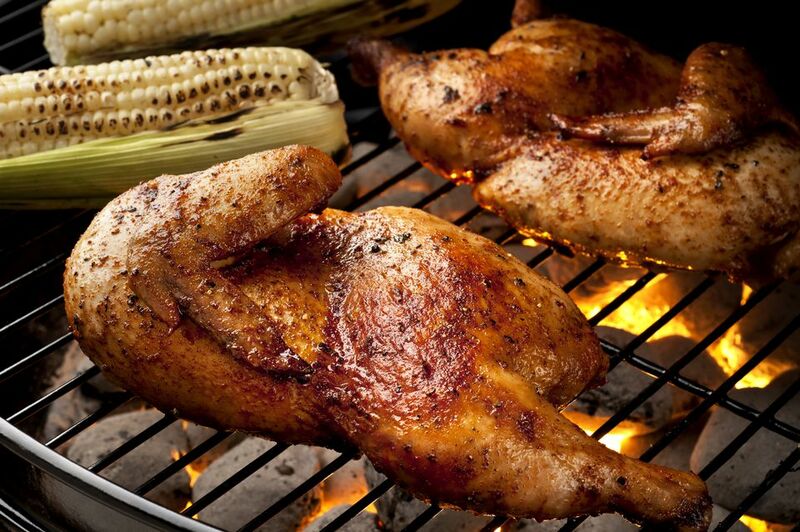 The meal originated in Lima Peru, and can also be called blackened chicken or rotisserie chicken. It is barbecued chicken cooked over coals. A Swiss man came up with the cooking technique in the 1950s, which involved marinating the chicken in a saltwater marinade, or salamuera. Then it is cooked over a slow fire on algarroba coals. The rustic nature of the chicken cooking involved manually turning the chicken on a metal spit, continuously, over the heat—a time-consuming job for the cook. Thanks to the creation of automatic rotisserie equipment, the process of cooking chicken (or any other meat) this way has become much easier. The popularity of the cooking technique has exploded globally and is used in several other cultures and countries. It can be cooked with popular spices found in Spanish cuisine, such as garlic, paprika, saffron, laurel, and cayenne pepper. You may notice some of those ingredients in these Spanish chicken recipes. Here are a few other recipes that incorporate signature Spanish tastes and chicken, which is called pollo in the Spanish language. Spanish Chicken With Green Sauce Recipe (also called Pollo con Salsa Verde): This traditional Spanish chicken with green sauce recipe is a quick and easy way to get dinner on the table fast! Perfect with rice or potatoes. Chicken in Pepitoria Sauce Recipe (also called Pollo en Pepitoria): This tasty chicken in pepitoria sauce recipe is a classic Spanish dish. Known as pollo en pepitoria, you will find it on lunch menus throughout Spain and elsewhere. Spanish Roasted Garlic Chicken Recipe: This traditional Spanish roasted garlic chicken recipe is easy to make, and always turns out moist and full of flavor. It's a perfect weeknight meal! Make Spanish-Style Garlic Chicken With Sun-Dried Tomatoes: Pollo al Ajillo con Tomates Secos is as easy to make as it is attractive, with bright red sun-dried tomatoes and bold green basil. Spanish Chicken Stew Recipe (also called Estofado de Pollo): Try this flavorful chicken stew, typical of stews eaten in the region of Castilla, where the winters are chilly, and food warms you from the inside out. Serve it with home-fried potatoes or warm, rustic bread and a simple green salad for a filling, delicious meal. Easy Spanish Style Chicken With Tomato Sauce Recipe: Looking for a quick, mid-week chicken recipe? This Spanish style chicken with tomato sauce recipe is a go-to meal for something simple and appetizing.